Our beautiful Neo-gothic church, built in 1925, contains carved oak pews to seat 350 (including the balcony). Original stained glass windows depict Easter Morning and The Ascension, while the ten jewel-toned side windows create a glowing and calming atmosphere. The building was added to the National Register of Historic Places in 1997. 1600 Grant Street, Denver, CO 80203. We are one block north of the state capital. Easy walking distance to various downtown and uptown hotels and restaurants for your reception. On-street and paid lots provide proximity parking. Our commercial kitchen and dining spaces are available for your reception, whether it is catered or self-catered, a light appetizer event or a full meal. This option, including renting our dishes and linens, may be perfect for those planning a reception on a small budget. Wine and beer may be served. Capacity for standing reception (wine, appetizers, and cake) is 200. Capacity for seated dining is100. Make an appointment with our wedding coordinator to tour our church and to discuss fees and reserve a date. A non-refundable deposit of $500 is required when booking a date for the ceremony and rehearsal. All fees must be paid 15 days before the wedding. Music, including additional musicians, must be arranged with St. Paul’s music director. Fees to individuals, as listed below, are paid directly to each person. Liturgical furniture (lectern, altar, etc.) may not be moved. Advent wreath (December) and Easter garden (spring) must remain in place. No hard liquor. Wine and beer may be served but cannot be sold. Saturday evening mass is held at 5pm. Afternoon weddings must conclude by 4 pm, but receptions may be held downstairs while Mass is being celebrated. St. Paul can supply a Lutheran pastor or Roman Catholic priest to officiate. You can also use your own officiant, after consulting with our pastor. 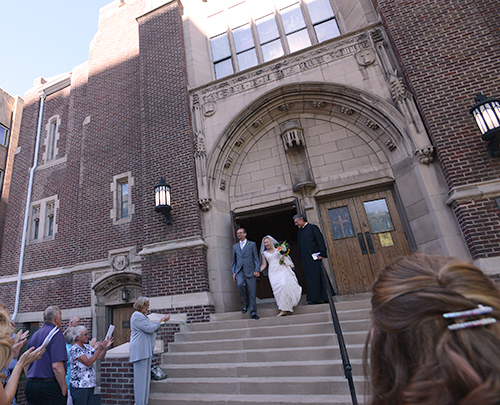 As you begin your life together, take pride that the fees you pay for this wedding venue will support an ecumenical community of faith that is committed to being “in the city for good.” St Paul welcomes persons of all races, ethnicities, and gender orientations. We are especially committed to outreach to the hungry and the homeless.